Manchester-based artist Naomi Kashiwagi’s practice focuses on inventing new uses for outmoded technologies, such as using a violin bow as a paintbrush. 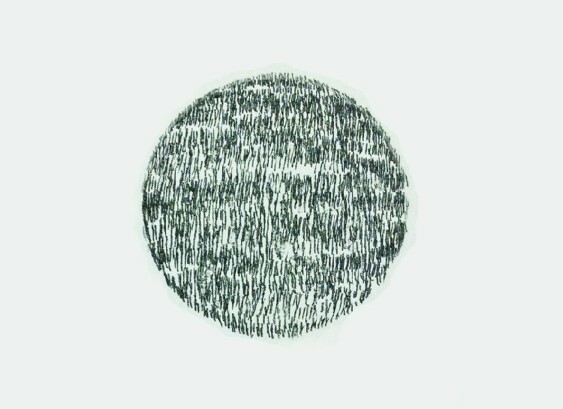 Kashiwagi trained as a painter and retains her interest in mark making, as demonstrated through her precision drawings. Graphic designer Peter Saville has been long been impressed by her work: "Naomi's inclusion of sound within the context of installation extends the dimension in which we can experience her work", Saville says of her work. For Kashiwagi, visual art and sound tend to overlap. In her latest work, Kashiwagi produces a glimpse of ambient techno by scratching a wind-up gramophone. This sound work ‘Decomposing Loops’ is currently on display at the ICA for the exhibition Soundworks. Dazed Digital: When did you first become interested in the gramophone? Naomi Kashiwagi: I initially bought a gramophone in 2005 to make drawings with, but then became interested in glitches and using analogue technologies performatively. I manipulate sound and extract unexpected loops, so it’s all about drawing out the sound. DD: What’s the relationship between drawing and producing sound? Naomi Kashiwagi: Even when I’m using the gramophone, the process is quite tactile and I see it as a drawing and engraving instrument. It is almost mark making rather than the sounds that are the dominant determining factor. DD: How did you write Decomposing Loops? Naomi Kashiwagi: I wanted to keep an element of chance within the way that I composed Decomposing Loops. I layered the sounds, but I’m not a sound engineer, so lots of compositional decisions were visual. I want this piece to be more about process and about creating a structure for chance. DD: What is the most unusual place you’ve performed? Naomi Kashiwagi: Do you know the Central Library in Manchester? I just loved the acoustics whenever you go into the reference room because it’s really echo-y. So when you drop a book, it just bangs. You can hear people turning the page. The library closes at 8 o’clock and usually they make an announcement, but they didn’t when I was performing so there were still people sat down reading. More people started coming in and it was just fascinating to see the looks on people’s faces who didn’t know what was going on. DD: What’s your next project? Naomi Kashiwagi: Next up is animating art gallery, museum and library collections with Huw Bunford from Super Furry Animals as part of ‘in the mix’. There will be performances throughout Manchester at the Whitworth Art Gallery, Manchester Museum and John Rylands Library) as part of Manchester Weekender.